Depth of field refers to the area of your photograph that is in focus. Depth of field can vary from having a very thin sliver of your subject in-focus to a very expansive focus that covers everything in your entire photograph. Many photographers understand that aperture affects the depth of field in your image, but there are other important considerations as well. Join in! Depth of field is this week's topic for the Boost Your Photography: 52 Weeks Challenge. Yes, changing the aperture of your lens will have an immediate and observable impact on the depth of field of your photograph. The four photographs in the series above were all taken from the exact location, with the camera on a tripod. 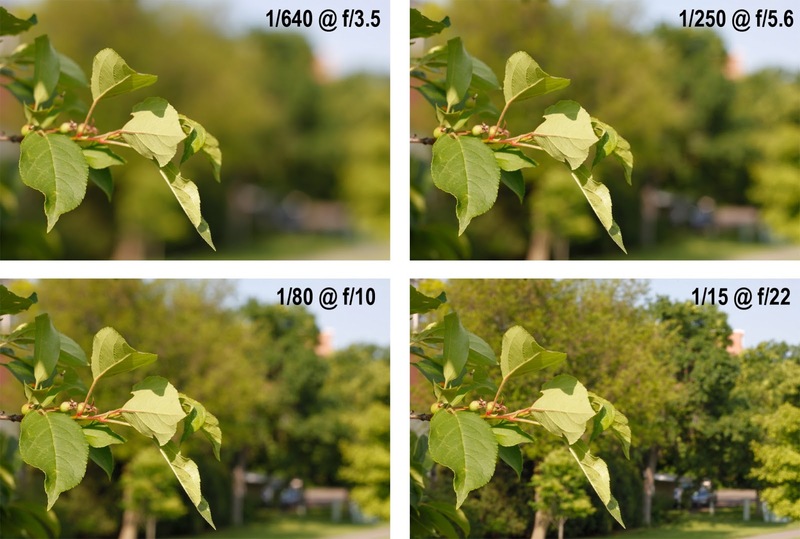 You can clearly see how the background trees change from being blurry greenness with the wide aperture to nearly in-focus trees at the narrow aperture. 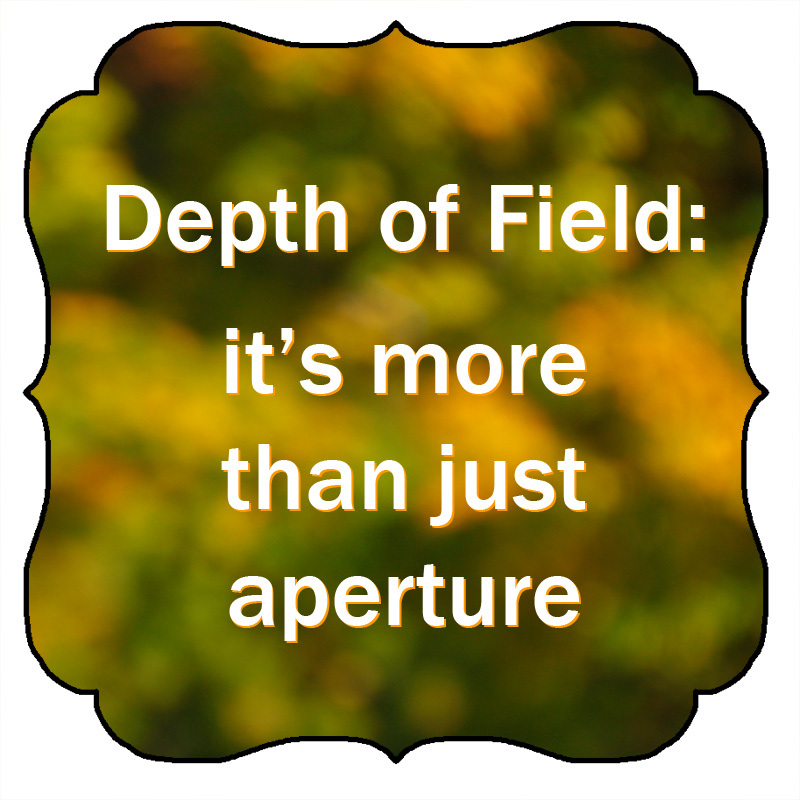 This relationship between depth of field and aperture holds true, provided that you and your subject remain in the same place. If either you or your subject moves position, then there are two additional factors that affect depth of field. Each of these photographs was taken with a constant aperture (f/6.3), but you can see that the effective depth of field changes dramatically. The longer the zoom used, the narrower the depth of field, and the more the trees in the distance become simply blur and color. The field of view also narrows dramatically: the background of the 270 mm shot is reduced to only one of the trees, compared to three entire trees in the 35 mm shot or a veritable forest in the 18 mm shot. This simplifies the background tremendously, drawing the eye toward our subject instead of being distracted by the background. This off-center photograph shows the setup used for the series above. The scarecrow is about five feet away from the green tree, while the other trees are at a significant distance. This illustrates a final point about depth of field: if you want a blurred background, you can give yourself a hand by positioning your subject farther away from the background. Look again at the series of photographs, and pay attention to the green tree. You will notice that the depth of field is still wide enough to encompass the green tree that is just behind the scarecrow, even at the longest focal length. 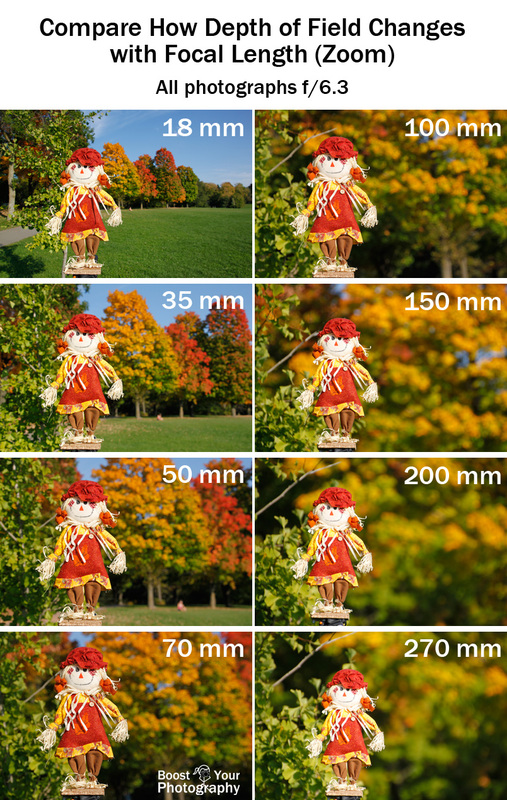 Only an extreme amount of aperture or focal length is going to be able to turn a nearby background into bokeh or blur. Make it easy on yourself. If you want a blurred background, then keep your subject farther away from it. Give it a try. Pick a subject and shoot a comparative series of shots, like the ones above, and see how much your depth of field changes as you use a longer focal length and get farther away from your subject. Or, shoot a series of shots at the same focal length and aperture, but move yourself and your subject farther and farther away from the background. See what distance gives you a look that you like. Looking to shoot a bokehlicious portrait with a blurry out-of-focus background? If you do not have a prime lens with a wide aperture (like the 50 mm f/1.8, read more here), use your zoom lens. Try the shot with a longer focal length, keep the background away from your subject, and see what you can do. Want a final reminder? Check out this chart on depth of field by Digital Camera World. Click on the pin to see the original post and chart. How do you use depth of field? Share a link or a photograph in the comments below, or consider joining the BYP 52 Weeks Google+ Community to share your weekly photograph and see what others are capturing.